Bad weather in the English Channel with winds of 10 Beaufort forced the "Black Watch" to make an unexpected stopover in Cherbourg on March 13, 2019. The ship had sailed from Funchal on March 9. It finally arrived at the Southampton City Cruise Terminal on March 14 at 6.40 a.m.
A tragic accident has occurred aboard the "Black Watch" at the Blohm and Voss shipyard in dock 11 in Hamburg. Inn an accident, one worker was deadly injured. Another worker has been taken to the hospital with serious injuries. The man was in danger of life. A massive steel bar had crashed and pinched the employee. One man died at the accident site. The injured employee was stripped of the steel bar and suffered serious injuries. The workers wanted to erect a scaffolding, while the disaster had happened on Nov 22, 2016, at 2:15 a.m. The criminal investigation will have to determine why the bar could fall down. The two workers were scaffolding builders and responsible for the various scaffoldings aboard the cruise ship which docked on Nov 19 and was due to be completed on Dec 13. During this time, a complete rudder and propeller shaft overhaul will take place, a new emergency power generator will be installed and the painting will be renewed. 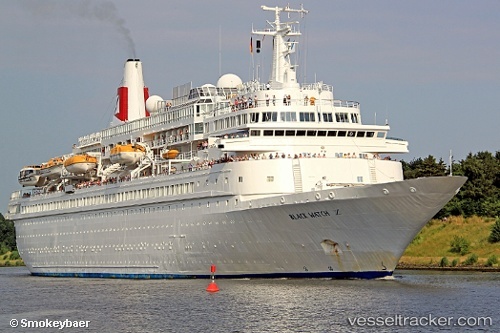 The British-based Black Watch cruise ship will undergo a major dry dock In November 2016. The refurbishment is part of a multi-million pound investment by Fred Olsen Cruise Lines. The vessel will be entering dry dock at the Blohm and Voss shipyard in Hamburg, Germany. The upgrade will take place from November 20 and is set to last 26 days. There will be lots of improvements, maintenance, and new additions during the dry dock.